If you’re familiar with the term “Taco Tuesday,” you know it has become a festivity of sorts — one day a week set aside to celebrate and eat this delicious meal. You can find a plethora of options when it comes to going out and picking up this delicious menu item, but how about bringing the fun home? We’ve put together a list of 10 tantalizing Aprons recipes that will have you commemorating Taco Tuesday every day of the week! 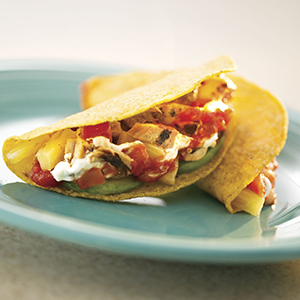 If you’re craving a chicken taco, we’ve got a great option for you. With the creaminess of an avocado and the tart kick of freshly squeezed lime juice, our Baja Style Chicken Tacos will delight your senses. Baja not your style? Try these more traditional Chicken and Rice Tacos with Black Beans. 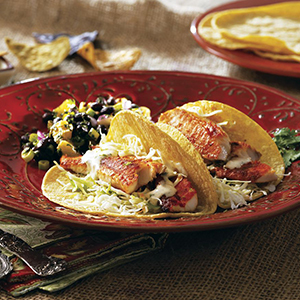 You can use many different kinds of fish for this dinner option, from Mahi and Cod suggested in our traditional Fish Tacos all the way to flounder, like our Smoked Paprika Fish Tacos. You can even use shrimp! Our Aprons chefs created a recipe for Crispy Baja Shrimp Tacos that you can try next Tuesday. No matter which you choose, if you like seafood, you can’t go wrong with these options. Pulled pork can make for a savory treat. Combine this tender item with flavors like ginger and mirin, and you’ll have yourself our Aprons recipe for delicious Korean Pulled Pork Tacos. Talk about giving this Tuesday tradition an international twist! If you love using your slow cooker, this next recipe is right for you. Simply throw the ingredients in and set it on high for three and a half hours. Let your pork shoulder blade steaks soak up the orange juice, onions, and seasonings for our take on Slow Cooker Pork Carnitas*. If something a little out of the norm sounds good to you, we have a few recipes that you’ll be interested in. First up, a recipe that will help get your Tuesday started off on the right foot. 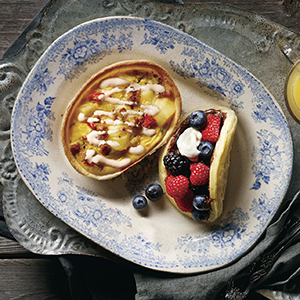 Using waffles as shells and filling them with some fresh berries, we created our Fruit Waffle Tacos. What a sweet way to start your day! 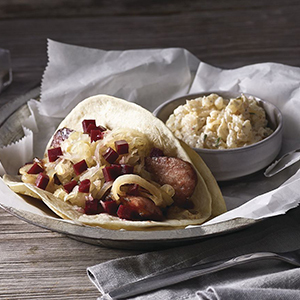 Secondly, we recommend our Bavarian Tacos with Pub Style Potato Salad. Yes, you heard that right, German inspired tacos. Who said sauerkraut and mustard weren’t made to be in a flour tortilla? Not us! Last but not least, if you want to celebrate Taco Tuesday but just aren’t in the mood for all the fixings, we have a savory solution. Try our one-pot Taco Chili! Satisfy your taco cravings with this warm flavor-filled bowl. There you have them, 10 recipes to celebrate the next 10 Taco Tuesdays! The only question left to ask is, will you choose hard or soft shells? Catalina H. became a Publix associate in 2012 and has thought of it as a home away from home ever since. When choosing what to write about, she thinks about her own life and what she wants to know more about – that way she can learn something new, too! Although her favorite Publix brand product is the Bakery Carrot Cake, you’ll probably find her snacking on peppers and drinking lots of water when writing her blogs. Outside of work, Catalina enjoys fitness, reading, crafting, and exploring new things (do you see a theme here? ).